Wide customer target: contractors, public bodies, police force, security, fire brigade, network managers, etc. According to a survey by MarketsandMarkets in 2015, the market should reach a value of USD 5.59 billion by 2020 with a growth rate of 32% for the end of the decade. Forecasts made in the early 2010s have not been fulfilled, however. Stalled by certain obstacles (technologies, regulatory issues, acceptability, etc.) the UAV sector has plateaued, although things have picked up over the last year or so. 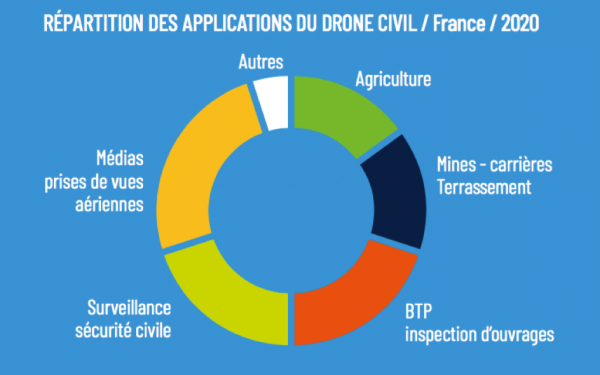 In France, companies with an end-to-end presence in the professional UAV value chain are emerging. They are specialised by field and are focused on the export market. Data and data processing are becoming core features in the economy of the UAV sector. With artificial intelligence and Big Data, UAV systems are seeing certain problems disappear, while potential new ones are emerging, such as automation and integration into airspace, etc. French and European regulatory frameworks are evolving with the aim of encouraging the growth of the sector while upholding requirements in terms of safety and certification. Source: PIPAME (Inter-Departmental Centre for Forward Studies and Future Economic Changes) – DGE (Directorate General for Business), Ministry for the Economy – DGAC (French Directorate General for Civil Aviation) – Export Growth Perspectives for the Civil UAV Sector, Summer 2017.